I have my second triathlon of the season tomorrow - the Salem Sprint. Luckily it's really short (300y swim, 15k bike, 5k run) and close by because it's been a rough week and I am not quite up to par. Last Sunday night through Monday I was laid flat out with a fever and all the pleasantness that goes along with that. I pretty much did not move from the bed for two nights and a day. I had night sweats for a few after that, a headache that's come and gone, achy-ness, and my appetite only just sort of returned yesterday. This was the last week of school and I'm really glad that my parents were able to come into town to see the last grandchild "graduate" from elementary school. They are staying through the race tomorrow. So of course on top of recovering I'd been doing some much needed spring cleaning and getting the house ready for my parents so it's not exactly been restful. I didn't train Tuesday but then tried a short run and swim Wednesday. Both were slow and labored and the GI system was not happy from two days of being "off my feed". Thursday went a little better with a short brick. 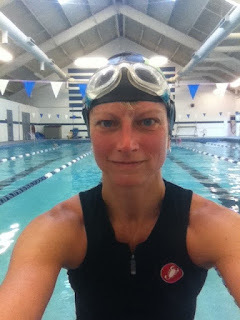 By Friday I was starting to feel a little back to normal and an easy spin and short swim went fine. Friday was the last day of school around here (a half day) so I figured we'd wrap up elementary school in my typical style. I managed to time it that I got my bike ride in and cycled into the garage at 12:52 for a 1:00 school pickup. I retrieved Grant, still sweaty and in my cycling clothes. I was expecting to be THE last parent in the carpool line as I often am, but I was a few cars away from that honor. Happy 4th Coach-iversary, Coach Jim!